There are subtle differences between the government’s termination for convenience (T4C) and government contracts termination for default clause decisions. Contractors who incorrectly respond to them quickly find the painful differences especially at the appeals stage. On the other hand, the government’s decision to issue a contract termination for cause (T4D) takes a totally different path. A default situation is more damaging to your reputation and ability to conduct future business with the federal government if not handled correctly. In either situation, you should act immediately to protect your legal rights. Once a case gets closer to a termination for cause, it is generally more difficult to reverse or properly negotiate. This is substantially different when there is a T4C in the commercial sector. Under federal contract law, the agency can issue a government termination notice when it is in the government’s ‘best interest” regardless of whether you are at fault. When the federal government issues a valid termination letter, the regulations allow the agency to avoid paying damages for the contractor’s profit after issuing the notice. In virtually all awarded government contracts, the termination for convenience clause is incorporated by reference. At the government’s whim, the contracting officer can decide to unilaterally terminate the contract either partially or completely so long as it is in the government’s best interest. Not all contract termination by convenience decisions are legally valid. The common question for contractors issue is what damages can they recover. Your goal is to always maximize damages quickly after receiving the termination letter. You must also mitigate damages because the government will try to reduce any payment if you do not. What are your legal obligations? When the agency issues a contract termination notice, the FAR imposes certain contractor obligations. For example, you must immediately stop the terminated work and immediately start to mitigate your damages. The T4C Clause requires the government to compensate the contractor with specific statutory damages. In order to get the allowed damages, contractors must submit a settlement proposal to the contracting officer within one year. When deciding to submit your settlement proposal, you should pay special attention to the definition of allowable costs. Keep the following in mind. When looking at the government’s actions, you should first see whether the government has breached the contract. Government contractors are entitled to recover under the reasonable expense of preparing and presenting their settlement proposals, including reasonable legal expenses. See Dellew Corp., ASBCA No. 58538, 15-1 BCA ,i 35,975 at 175,783. The problem is usually that the government will challenge the support for your compensation amounts. Courts on appeal will agree with the government if you do not provide sufficient evidence to support your damages or compensation. The main problem that you want to avoid is simply making conclusions or providing self-made spreadsheets. Instead, you want to focus on providing actual invoices, timesheets or payroll and more defined evidence. All claimed amounts must have been presented to the contracting officer. One of the most deadly legal mistakes that you want to avoid is making the conclusion that if the contracting agency denies your request for settlement proposal compensation that you will increase the amounts on appeal. This is a very dangerous mistake. Trying to get more compensation in an appeal will get that portion of the claims dismissed because the appeals court only had jurisdiction hear claims properly submitted according to the Contract Disputes Act and denied by the contracting officer. Courts interpret the “best interest” standard very broadly in a government convenience termination case. There are situations when contracting officers terminate the contract only to immediately reissue a new contract for the exact services or products. In these situations, a court may look at the agency’s actions to see if the contracting officer simply seeks to get a better deal. In the landmark case of Krygoski Const. Co. v. United States, 94 F.3d 1537, 1541 (Fed. Cir. 1996), the Federal Circuit Court ruled that the contracting officer cannot terminate a contract in bad faith or abuse his or her discretion. If your company prevails in showing bad faith or an abuse of discretion, you can be fortunate to get common law damages over the statutory damages. See the case of TigerSwan, Inc. v. United States, 110 Fed. Cl. 336 (2013). As stated before, very few cases favor contractors on these topics. When contractors appeal the government’s termination for default or convenience, proving that the contracting officer acted in bad faith is very difficult to prove. See Am-Pro Protective Agency, Inc. v. United States, 281 F.3d 1234, 1239 (Fed. Cir. 2002). What evidence do you need to prove that the government acted unlawfully? Hard evidence is what a court looks for. Companies should seriously look at the level of substantive evidence they have when deciding to go down this path. Here are a few suggestions of evidence to gather before contacting a government contract termination attorney. Evidence that the agency was negotiating with another contractor for the same scope of work – look specifically at 8(a) sole-source awards. After terminating for convenience, the government publicized another solicitation for the same scope of work. The steps the contractor should take to reduce the impact on their staff if the termination, together with all other outstanding terminations, will result in a significant reduction in the contractor’s work. Tip: If you are seeking damages under the contract clause, the process allows you one year to submit a settlement proposal. However, you may want to consult with a lawyer at the early stages because government employees rotate or retire. Under what authority can the contracting officer terminate a contract for default or cause? Federal government agencies use the Default Clause, often referred to as termination for default , when contractors fail to meet delivery schedules, fail to comply with the terms and conditions of the contract or some other contract performance breach theory. Litigation as to what “best interest” of the government means very seldom gets the court’s sympathy unless you have hard facts to show that the government may have acted in bad faith. By comparison, in a default case, you have to show that you complied with the contract terms or that the government caused the underlying reason for the termination or that your alleged breach was excused or legally justifies. The government’s posture will be a lot more adverse than with a default case. Furthermore, the costs associated with termination for default clause are much different. FAR T4D implications to contractors. Without properly defending your rights, you could face suspension or debarment and even lose the ability to do business with the government in the future. In addition, if you are not able to prove that the termination was unlawful, the contracting officer can even go after reprocurement costs and other damages. Government’s pursuit is for breach of contract from the contractor: The T4D Clause is essentially a breach of contract allegation. The agency will allege that you have not complied with terms of the contract. This puts your company in a tough position because it now has to defend itself and now put together evidence to present on appeal. Failure to adequately defend the T4D may mean that you have to pay the government. The urgency of the need for the supplies or services and the time required to obtain them from other sources, as compared with the time delivery could be obtained from the delinquent contractor. The degree of contractor importance to the Government acquisition program and the effect of a termination for default upon the contractor’s capability as a supplier under other contracts. The effect of a default on the contractor’s ability to liquidate guaranteed loans, progress payments, or advance payments. When the agency issues a termination for default letter, contractors must make an informed decision to either appeal or not. A government default appeal can be heard at the respective Board of Contract Appeals or the U.S. Court of Federal Claims. There are specific deadlines to file your appeal. Read more on how appeal courts look at contract T4D cases. Keep all records: To avoid problems, keep records of communications with the government. As stated earlier, the difference between the termination of contract for convenience and for cause is very fact-based. 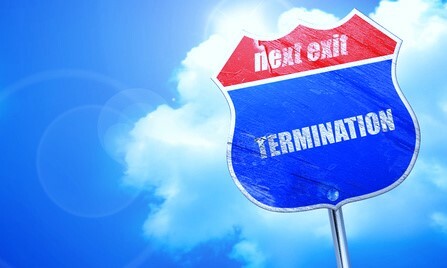 Learn when defaults are converted to a termination for convenience. Make sure that contracting officers are included in all related communications: It is critical to keep records of communications with government contracting officials, including the Contracting Officer Representative (COR) about situations leading up to the termination. Remember that evidence showing that the COR directed you to do something can hurt your case if the CO has no knowledge of it. Consider the possibility of negotiating for conversion to a termination for convenience. FAR terminations for default clause can cause forfeiture or amounts of money owed: If the Agency alleges that you have submitted false claims or there are re-procurement costs, the Agency may put a hold on unpaid invoices. There many other issues when considering the difference between a contract termination for cause vs convenience clause. Understanding your legal obligations and rights are essential to the outcome of your case.